The University of Maryland was once again highly ranked in the U.S. News & World Report's 2016 Best Graduate School rankings, with 26 programs and specialties recognized. 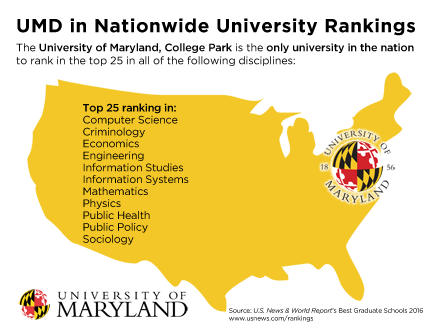 UMD was the only university in the nation to rank in the Top 25 in all of the following disciplines: Computer Science, Criminology, Economics, Engineering, Information Studies, Information Systems, Mathematics, Physics, Public Health, Public Policy, and Sociology. The full list of Best Graduate School rankings are available here.